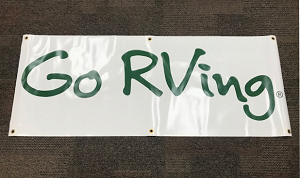 Vinyl 'Go RVing' Banner - white with green lettering. Has 3 grommets on the top and 3 on the bottom for easy hanging. Support the Go RVing campaign and help raise an awareness of RVing! The Go RVing Static Clings are great for Windows, Mirrors or the side of an RV. As long as it has a flat clean surface, the cling will stick to it. These images are right facing, not mirror images. Focused on family adventure, couples travel, and outdoor experiences, Go RVing’s multi-media marketing campaign continues to emphasize the flexibility and affordability of RV travel for today’s consumers. This optional program is an ideal way to bring the Go RVing national campaign into your own advertising and promotion, while providing access to new leads generated by the Go RVing web site. Online access to Go RVing leads, prioritized according to purchase time frame. 24 hours a day, 7 days a week, for Go RVing dealers signed up for the tie-in program. Go RVing dealers will receive new 2019 Go RVing “Kick Off to Camping Season” promo materials for display at the dealership, retail shows, and other special events. The branded materials will be available in the first quarter of 2019. Target your markets with customizable versions of the Go RVing national commercials or create your own using the latest stock footage, both now available as downloads. Go RVing Dealers signed up for the program have access to multiple high-resolution images of consumers enjoying a variety of RV products to use in advertising, websites, social media, and other promotional materials. Click Here for a list of optional items you can purchase to promote the Go RVing lifestyle in your dealership. Ready to sign up or have any questions? Email Chuck Boyd at cboyd@rvda.org or call him at (703) 591-7130 x113 or on the RVDA member service hotline (888) 687-7832.